3x X319UST projectors blended to fill the field of vision and create an immersive space. Integrex is a leading UK designer and manufacturer of innovative, interactive electronic and IT products for education, retail and corporate sectors. With over 40 years’ experience, it specialises in the design, development, manufacture and installation of interactive and immersive special needs equipment, bespoke kiosks and cutting edge corporate AV systems. Stockton-on-Tees Borough Libraries was successful in its National Lottery application to the Libraries Opportunities for Everyone Innovation fund to create an immersive space in its main library in Thornaby which would support a variety of health needs. Integrex, which has over 40 years’ experience in the development, manufacture and installation of interactive and immersive special needs equipment, was appointed to install an Immersive Room in the library. 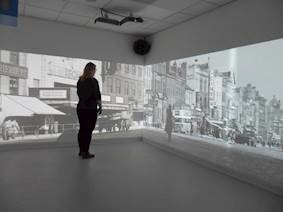 Using the latest motion tracking technology and Optoma ultra short throw projectors, Integrex’s immersive rooms can be fully interactive, featuring highly responsive interactive floors and walls. Three Optoma X319UST ultra short throw projectors provide the clear, bright imagery the library needed for the immersive room. Its ultra-short throw lens can project a 100 inch image (diagonal) from less than 50cm from the wall, ensuring there are no shadows from people using the space. The projectors were edge blended across two walls, seamlessly wrapping the imagery around the corners. This was linked to Integrex’s sensory hardware to create the immersive environment. 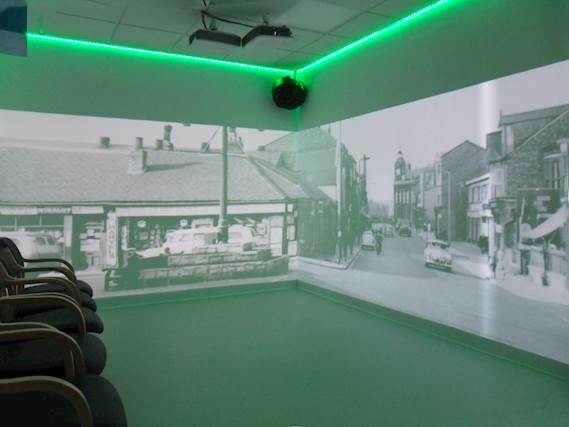 Most immersive rooms supplied by Integrex have interactive functionality but this was not needed for this installation. The additional sensory hardware available as part of Integrex’s Immersive Rooms includes a wind machine, smoke machine, aromatherapy unit, coloured lighting, bubble walls, UV lights, star ceiling and soft padding with optional vibration. Emma Hughes from Integrex said: “Customers can have ocean scenes with interactive water ripples, swimming fish and blue lighting to create an underwater feel; or bonfires with a bursts of smoke from the smoke machine and smoky smells from the aromatherapy unit. They could even have a snowflake scatter projection with a blast of wind from the wind machine. Integrating all the sensory stimulation creates a completely immersive experience. They are also fully customisable. The immersive room is all controlled via Integrex’s Sensory Room software. This has hundreds of pre-created themes, including fifteen interactive themes, and a library of over one thousand pictures and videos to allow users to create their own content. Users can import pictures, video or stream content from YouTube, if required. All Sensory hardware can be controlled through the playlist scheduler, activating and deactivating or changing colour or scent as the themes change. Content for the immersive room can be changed remotely and then imported into the room so that there is very little downtime needed when changing content. Stockton-on-Tees Borough Libraries opened its Imagination Station at Thornaby Central Library in May 2018. 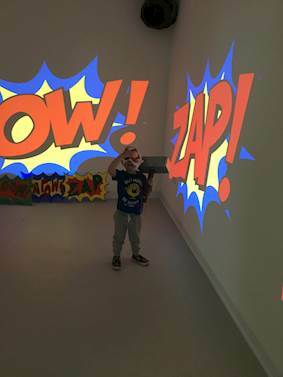 The immersive space is providing is providing sensory and immersive experiences for older people, people living with dementia, autism, sensory or learning disabilities and those with a need for quiet space. This has allowed the library service to work with a variety of partners including the Dementia Hub. During National Dementia Awareness Week Stockton Library Service held drop in relaxation sessions with historic imagery, sounds and smells for a fully sensorial immersive experience. One local resident, who lives with dementia and often experiences anxiety and aggression, has found the Imagination Station the perfect solution. He explained to the Health and Wellbeing Librarian that nothing has helped him deal with the challenges he faces more than sitting in the room and experiencing familiar images, sounds, videos and aromas. With the success of the immersive room, Stockton-on-Tees Borough Libraries made the decision to buy an Integrex SENse portable unit for the wider communities in the Borough who are unable to visit the room. The Integrex SENse combines high technology with simple design to provide a low cost, mobile, immersive sensory system that responds to body movement when it is detected by the overhead camera. With multiple themes and images, combined with in-built audio, the SENse unit projects onto the floor to create an interactive surface. Stockton-on-Tees has nine community libraries of varying size, stock and services plus its mobile library service to rural communities. Each of the libraries provide traditional book lending, free computing facilities, with WiFi in most branches, events and activities.